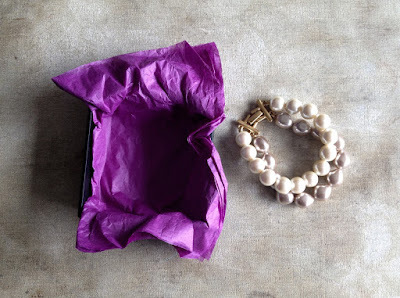 So I'll start this series with a pearl bracelet from Tracy Scott who lives in Atlanta, GA. Tracy is a collector of my work and over the years we've shared lovely back and forth conversations through email. I was happy to get her package because she has become quite special to me. Then I found myself speechless when I opened it. Inside was a card and a black box. I opened the card first to find thoughtful text describing the pearl bracelet she had sent accompanied by two photographs. Tracy told me it was the bracelet she had worn at her wedding in 1992. She also wrote it carries "very joyful memories" from her to me. The photographs were from her wedding: one of Tracy and one of Tracy and her new husband. Wrapped among layers of purple tissue paper was the bracelet, a double-strand of big, creamy pearls. 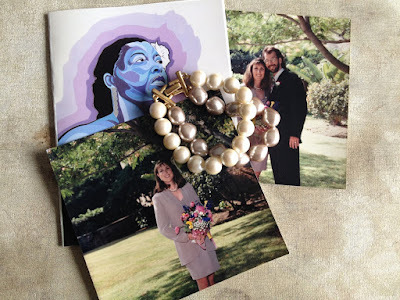 Wedding jewelry, or any jewelry worn on a special occasion, is incredibly personal and sentimental; to let something like this go seems like a big deal to me. The bracelet felt heavy in my hands, in a good way, as I looked at the photos and then closed the card. And, yes, I'm still accepting contributions! As soon as I'm settled in San Francisco I will post a new address you can send them to. Please email me at atavern@gmail.com if you have any questions.